On a good run, despite heavy criticism: Karim Benzema stepped up in the year 2018. 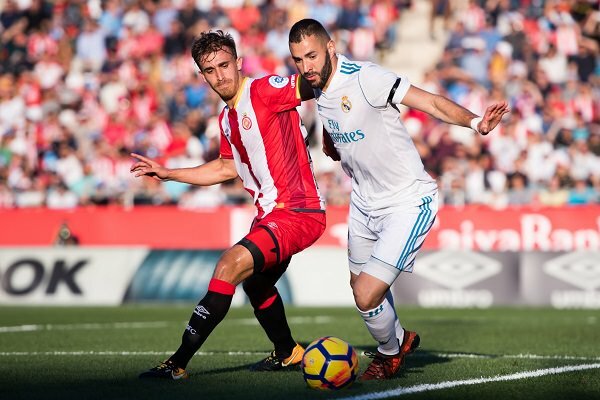 Ever since the 2018 has begun, The Reds and Los Blancos have suffered five defeats each. Interestingly enough, merely two days after LFC’s January astonishing failure at Swansea, Madrid has been eliminated from Copa del Rey by Leganés in one of the biggest upset away wins in Estadio Santiago Bernabéu’s history. Beyond that, Zinedine Zidane’s men have experienced the wrath of Villarreal, Espanyol, Juventus and Sevilla while Jurgen Klopp’s lads have been exposed by West Brom, Manchester United, Roma and Chelsea. In terms of losses, one might call it an even split here. Liverpool have scored 46 Champions League goals this season. Things are looking far better for the Merseysiders in the defensive department. 25 goals conceded in 25 matches isn’t exactly the Atlético Madrid level of performance but it still holds the advantage against Real’s 41 goals in 32 matches. On the top of that, Reds have piled up eleven clean sheets to RM’s six; in fact, counting the last 11 clashes, only Celta Vigo have failed to put a single ball past Keylor Navas. On Saturday, even despite not being able to field Joel Matip and Joe Gomez, it will be Klopp, who’s going to be more reassured about the resilience of his five-man safeguard. Real Madrid: 8/10; Liverpool: 7/10. 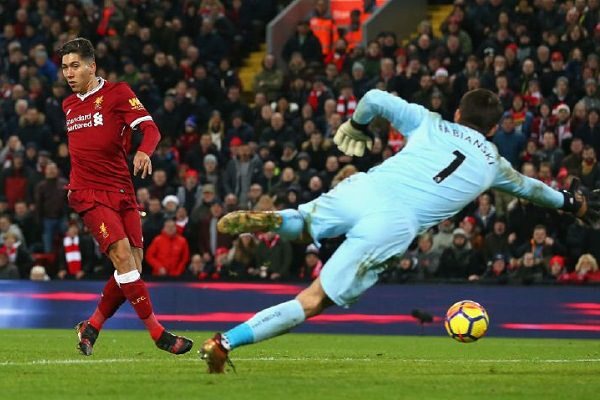 No-look goal from a no-rest forward: Roberto Firmino beats Swansea’s Łukasz Fabiański. As usual: the issue of fatigue is paramount the way the match pans out. Liverpool are on a thirteen-day break; Real Madrid are on a week-long one, though they rested Navas, Asensio and Benzema against Villarreal. Alas: this topic goes far deeper than a single rest. There’s a catch, though. 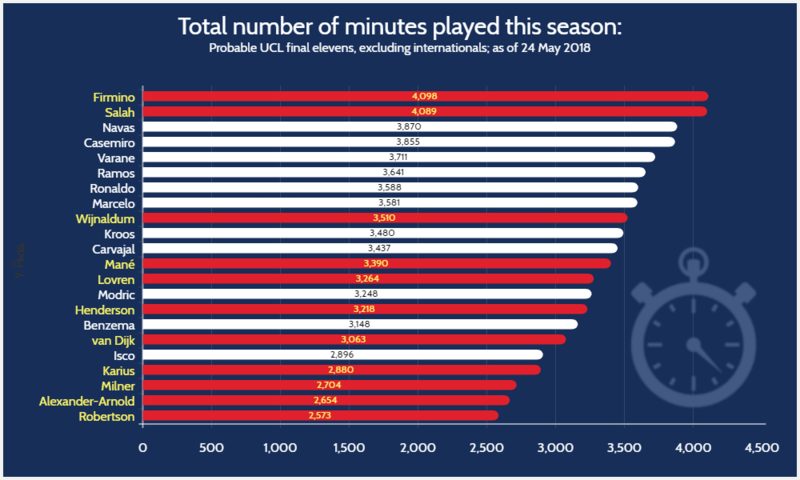 The Reds’ key forwards, Roberto Firmino and Mohamed Salah, have both been involved in more game time than any of Madrid starters. In fact, Bobby’s been out there for 68 hours and 18 minutes; Mo – 68 hours and 9 minutes. Even injury-struck Sadio Mané has produced 56 and a half hours of play. Cristiano Ronaldo (59 hours and 40 minutes) or Karim Benzema (52 hours and 28 minutes) aren’t nearly as overworked. Still: the bigger picture is marked by The Reds’ superiority. Real Madrid: 5/10; Liverpool: 8/10. After countless games won and limitless experience gained, Ronaldo is hungry for more. 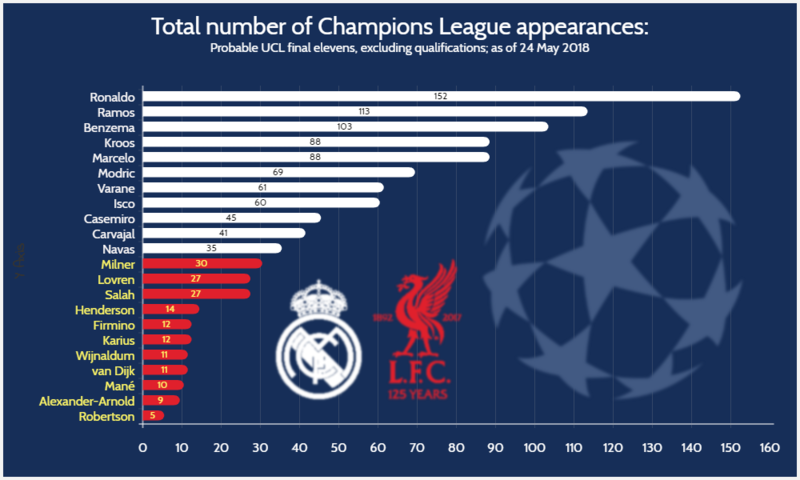 If fresher legs were significantly favouring Liverpool, richer Champions League experience favours Real Madrid so overwhelmingly that there’s simply no comparison. Cristiano Ronaldo alone has played only sixteen UCL games less than the entire LFC’s predicted starting eleven; in fact, when the Portuguese star was lifting his first, big-eared trophy in Moscow, Trent Alexander-Arnold still attended St. Matthews Catholic Primary School as a fifth-grader. As a unit, The Reds are still work in progress. Lovren picked up some of his first Champions League apps at Olympique Lyon; Milner – at Manchester City; Salah – at Basel and Roma; van Dijk – at Celtic. This is effectively their breakthrough season – but can they outwit the absolute veterans of the struggle? Real Madrid: 10/10; Liverpool: 4/10. Solid squad player: The Normal One before emerging as a world-class manager. The careers of these two never overlapped directly. Five years older than his adversary, Jürgen Klopp would join the football youth system in a small town in Baden-Württemberg when Zinedine Zidane was three months old. While Zizou was about to make a senior-level breakthrough at Cannes, his German colleague spent time fruitlessly trying to climb out of reserves and into the starting eleven of Eintracht Frankfurt. And the summer ZZ broke the world transfer record by joining Real Madrid, JK called it quits at Mainz, transitioning from The O-Fives’ solid centre-back to the club’s new manager. Really sad news for AS Cannes – the club that brought you Zinedine Zidane, Patrick Vieira, Clichy, Frey, Zebina & more has been liquidated. And now, here they are. Klopp – motivational genius with a keen eye for young talent but also a serial loser of the finals, crumbling to Bayern in Champions League, Sevilla in Europa League, as well as in two German Cup contests and one Capital One Cup clash. Zidane – absolute managerial prodigy, moving through the ranks of of Madrid youth teams to turn his senior underlings into serial winners within few months. Both finished more than a dozen of points behind the winners of their domestic leagues; both experienced shocking cup losses too. This is their final chance to turn around otherwise imperfect seasons. At the moment, it is impossible to separate those two. Zidane might have won UCL twice but it’s Klopp whose team is now breaking the goalscoring records of the competition. Zidane needed two offside goals, two rejected penalty calls and an unjust red card to coast twice past ageing Bayern Munich – meanwhile, Klopp has outplayed prime Manchester City fair and square. Zidane gets the nod for picking up the silverware; Klopp – for creating progress in a fairly difficult environment. Could there be a better duel to settle this winded comparison? Real Madrid: 9/10; Liverpool: 9/10. 22° C, sunny, no wind – will this be the weather for Madrid to finally take Kyiv by storm? Considering their stature, Real Madrid have a history of underperforming in the capital of Ukraine. Forty five years ago, they drew 0-0 at Dynamo’s Olimpic Stadium and took the Champions League quarterfinal tie to the second leg, which was won 3-0. In March 1999, things went even more sour: 22-years old Andriy Shevchenko scored a brace following a penalty and a marvellous Serhij Rebrov’s pass. Thus, Sheva secured a sensational 2-0 scoreline that eventually saw his side coast past Los Blancos to the UCL semi-final. After that, things weren’t much better. One win and two draws in which the visitors needed to overcome 0-2 deficits are hardly impressive for a team aspiring to win every single match in every possible venue. On cold November and December evenings, often thrown on muddy or half-frozen pitches, the Spaniards looked vulnerable. 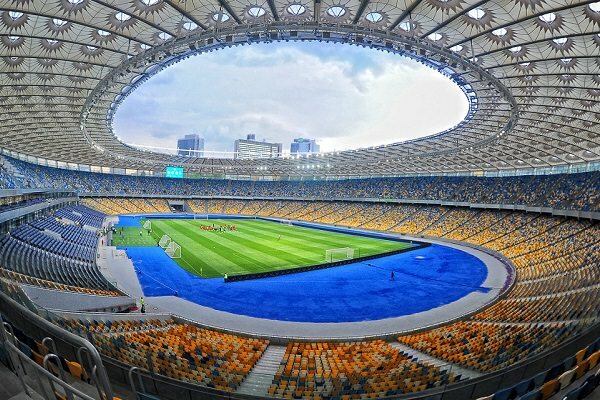 In two days, the weather conditions shall not be nearly as harsh – but then, Liverpool (one win in Kyiv, back in 2002) are far tougher than any national champion Ukraine can field these days. Real Madrid: 6/10; Liverpool: 8/10. TOTAL POINTS: REAL MADRID: 38/50; LIVERPOOL FC: 36/50.